The Field Guides to Australian Fauna are a suite of eight apps, one for each state and territory in Australia. They are available for Apple and Android devices, and optimised for both tablet and mobile phone screen sizes. They are free to download and have no in-app purchases. This is an example of museums producing apps that can be used anywhere, and don’t require users to visit a museum venue to enjoy and find value in the content. 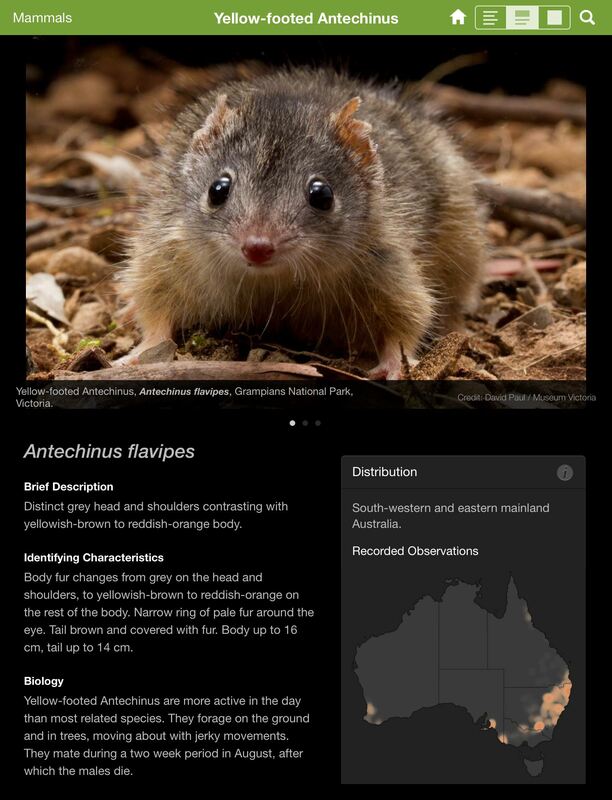 Having been produced by museum professionals, the Field Guides to Australian Fauna suite of apps are seen as reputable and authoritative sources of information and are valued by the community of users. Field guides are used to assist with the identification of animals in nature. They have traditionally had an audience of scientists and amateur naturalists, who were willing to carry around heavy books specialised for the purpose. The Field Guides to Australian Fauna suite of apps can be used by everyone, everywhere – from families in their own backyards, to students on school excursions, to tourists in national parks. Together they feature over 2100 animals, including mammals, birds, fishes, reptiles, frogs and invertebrates from terrestrial, freshwater and marine environments. A separate app was produced for each state and territory around Australia, partly because the download size for a single app would be very large but also to allow each partner organisation around the country to be their own app publisher. This has been beneficial to each of the museum partners, some of whom became app publishers for the first time with this project. Having their own app has allowed each museum to take on their own publicity and marketing, in the way that suits them best. The project was funded by the Australian Government through the Inspiring Australia initiative. An important additional collaborator was the Atlas of Living Australia. The base layer of content in each app is the species profile. This contains a descriptive text, photographs, conservation status and a map. Additional features include flight times for butterflies, calling times for frogs, depth information for marine animals, and audio calls for birds, frogs, and other noisy critters (koalas, possums, foxes, etc). Each collaborating institution brought in the expertise of their scientists, collection managers, honorary associates and photographers, and they are credited on the species pages. In all, over 350 people from around the country contributed content to the suite of apps. Victorian Field Guide app showing species profile with image. Data only view of a species profile using the Victorian Field Guide app as an example. Users navigate into the content by browsing through animal groups (birds, mammals, etc) and subgroups (kangaroos, possums, etc), or via an alphabetical list. Screenshot showing the navigation hierarchy using the South Australian app as an example. A search function also provides a way to quickly find particular animals. Image showing search function in the apps. In order to give the apps the sense of being a ‘suite’, a consistent look was applied to the homescreen. The faunal or bird emblem of each state was chosen and illustrations from early Australian publications about each species were used. Homescreen for the Field Guide to Queensland Fauna showing the koala as the state emblem. Homescreen for the Field Guide to Western Australian Fauna showing the numbat as the emblem. Displayed altogether in the app stores, the graphic consistency does provide a sense of the apps all being related. Each app was launched in its home state/territory on 1 May 2014 with simultaneous launch events happening around the country. In order to ensure that the app content is available to the widest possible audience, the text for each species profile was also loaded back into the Atlas of Living Australia. The source code for the apps, developed by Museum Victoria, has been made available on GitHub under an open-source licence. The base code further refines the Genera project, previously discussed at Museums and the Web in 2012 (http://www.museumsandtheweb.com/mw2012/papers/creating_a_mobile_app_ecosystem_the_genera_pro.html ). At least seven other organisations or individuals have now used the open source code to produce their own field guide apps. These include the New Zealand Marine Life app (https://itunes.apple.com/us/app/new-zealand-marine-life/id661468952?mt=8) and the Grand Canyon National Park app (https://itunes.apple.com/us/app/grand-canyon-national-park/id654819217?mt=8). In addition, Museum Victoria has provided a page on its own website that describes the whole suite of apps: Field Guide apps to Australian Fauna http://museumvictoria.com.au/national-apps.